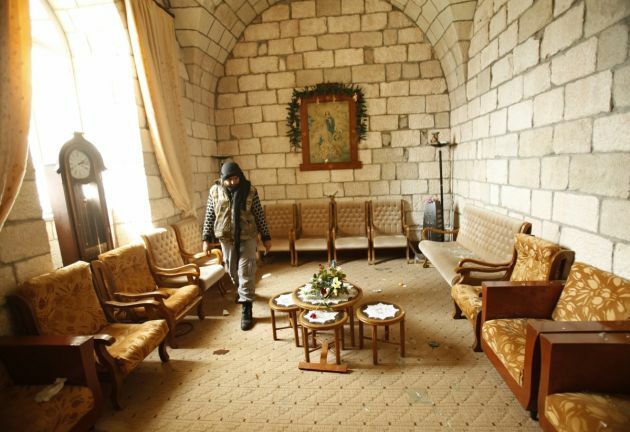 (Photo: REUTERS / Ammar Abdullah)A rebel fighter from the Islamic Front walks inside room at a church in the Armenian Christian town of Kasab April 4, 2014. Islamist insurgents launched an offensive around March 20 into Syria's Latakia region on the Mediterranean coast, taking both the border crossing with Turkey and the Armenian Christian village of Kasab on the Syrian side. BEIRUT (Reuters) - Syrian soldiers backed by Hezbollah fighters recaptured on Monday the town of Maaloula, north of Damascus, military sources and state television said, closing off more of the rebel supply route through the Qalamoun mountains near Lebanon. Islamist fighters, some from the al Qaeda-linked Nusra Front, took over a quarter of the ancient Christian town in December and held several nuns captive. In March, the nuns were released in an exchange deal with Qatari and Lebanese mediation.